I’ll hang my head in shame and admit it – I’m 30-something and I’ve never carved a pumpkin lantern (or even a turnip version as was traditional back in the day!). I’m actually a little disappointed in myself as I’ve always been someone who is completely into all the little festive traditions throughout the year – Easter egg hunts, Halloween parties, Christmas shopping day and don’t get me started on Stirrup Sunday! Now that I’m a Mummy, I love to mark occasions throughout the year and enjoy traditions, new and old, with my own family. I decided 2014 was the year we would make our first pumpkin lantern – hurrah! Cue the warm fuzzy glow of making family memories. Inspired by all the celeb family photos at pumpkin patches in the US, I scoured the internet looking for somewhere we could visit to select our own. What a disappointment! Not only could I not find anywhere near us, I couldn’t actually find anything in the whole country! It seems we do strawberry and raspberry picking galore but no pumpkins. It’s time to pull your socks up Great Britain! No pumpkin patch for us, so off to the supermarket we went – distinctly less exciting but we secured our pumpkin nevertheless. Poor Wonderboy almost broke his foot when he thought he could carry it himself so we hobbled back home to commence our work of art. 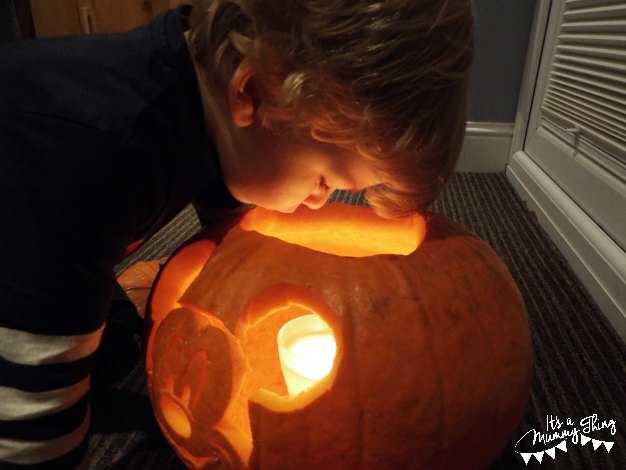 Armed with mini carving tools (totally recommend these as I can’t imagine it’s easy with a kitchen knife) we set about transforming our pumpkin into Wonderboy’s favourite character, Mickey Mouse. I was delighted to find hundreds of free pumpkin templates online which cater to all tastes and characters so, if like me, you’re not arty enough to come up with a design yourself but want something a little fancy, then just have a look. Anyway, it was pretty easy once I got started carving and while Wonderboy might not have been particularly interested in the process, he most certainly loved the end result! Not sure we can legitimately tick it off his 50 Things To Do Before You’re 5 list, but I can definitely tick it off mine! What does your family do to celebrate Halloween? Ha, I didn’t realise there were special tools!! I’ve been hacking at them with knives the last few years. Will have to invest next year, Mickey looks amazing. You’re braver than me! I went the easy route and got a little kit of mini carving tools. Only a couple of pounds so not sure they’ll last very long but much easier than a knife.